I have been lacking inspiration. Maybe because it’s the middle of a dull, gray January, or maybe because math is killing me slowly. Whatever the reason, my creativity has been zapped. I did manage to spot these steps on the way home Sunday. Located downtown Bellingham, I remember not to long ago when they looked like a giant, dirty mess. However, now that the design is complete, I can appreciate the pieces of rock and broken glass carefully arranged to look like streams running down a hillside. If only I could put my brain to some good use and create something beautiful…or write something. Creativity can be such a curse sometimes. It’s hard to summon and seems to appear when it wants rather than when I want. I think my creativity is laying on a beach somewhere sipping margaritas. Actually, I like this image. Beautiful steps. Not bad for an uninspired day. I can relate about having those kind of days. But at least it’s not freezing cold. I love those steps! And I think the dull, grey, rainy days are stalling my creativity too. I didn’t take a picture all weekend and I totally intended to. Maybe we should aim for a photo walk next weekend, Cassie? I have plans with my Mom on Saturday, but maybe we could get together Sunday? I know the feeling on the creativity drought Jolene, I’ve suffered it from time to time myself. Never fear, it will be back! In the meantime, these are some amazing steps, great shot! Thank you for the encouragement, Jim! I think if the sun ever returns here it will make all the difference. That’s an interesting idea! 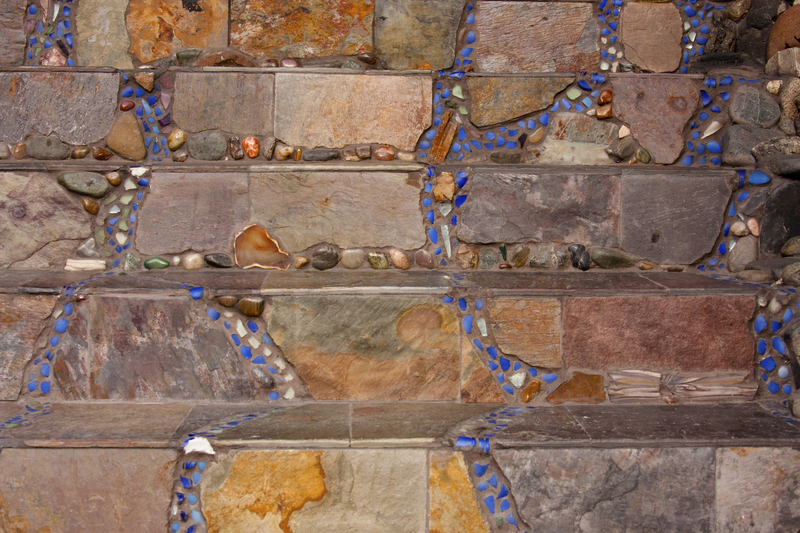 Most people who construct steps don’t include an artwork. They sure don’t…The small details I found on these steps were also really interesting. Especially the old, cobalt bottles broken up to make the “streams”. Lovely steps — awesome imagery comes to mind! Thanks for sharing and I heart too the banner — your cork collection?